If you think you may be suffering from a heel spur and live in Manassas, Centreville, Bull Run, Nokesville, or any surrounding area, turn to Dr. Mukesh Bhakta, D.P.M. at Prince William Foot & Ankle Center, PC and South Riding Foot & Ankle Center. Dr. Bhakta has treated heel spurs and a variety of other podiatric conditions for more than a decade, and is committed to ensuring his patients receive the compassionate, comprehensive medical care they deserve. 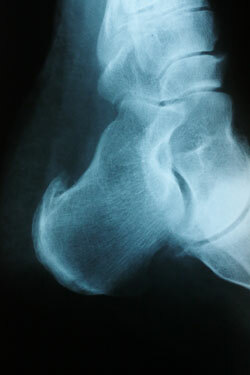 The proper diagnosis of a heel spur often requires an X-ray. To make this process as convenient for his patients as possible, Dr. Bhakta has on-site digital X-ray and diagnostic ultrasound machines at his Gainesville, VA, office. This can make it unnecessary for patients to visit diagnostic imaging centers, allowing patients to receive more expedient treatment. Contact our office to learn more about the diagnosis and treatment of heel spurs, or any other podiatric condition, such as an ankle sprain or toenail fungus. You can also click here to schedule an appointment with Dr. Bhakta.